Today I started to move some paintings out of my studio. (Over the past few days, it has become clear that the situation is no longer workable.) This makes me very sad because I love that little studio and will miss it. It is the world's smallest studio but it has great light. To make the process easier, I am going to try to do a little of the moving every day, and while I am at the studio, I hope to take advantage of the time and do some art work. So that is what I did today. 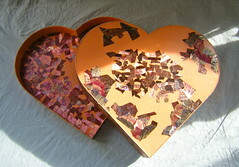 I spent an hour working on this heart-shaped box that I am covering with collage and decoupage patterns cut from printed metallic ribbons. Today I spent the entire hour working on the bottom of the box (shown here), building the floral border around the edges. As I lost myself in the joy of piecing together leaves, roses, and forget-me-nots, I realized that although I do love my studio (and that it is important to have "a room of one's own"), a large part of what makes me so happy there is just doing the art. During yesterday's walk at Long Hill Gardens, I noticed a shrub with beautiful big leaves with fantastic fall colors, so I took a picture. At Long Hill Gardens, some of the trees and plants are labeled, which is how I know that this is oakleaf hydrangea. 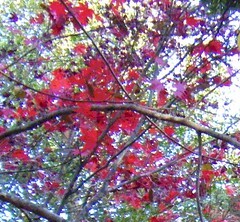 Tonight I used iPhoto to clean up two holes in the leaves. Then I opened the photo in Painter and posterized it. Then I cropped the photo to get this composition. Today I went to the studio to work on this project, a heart-shaped box that I am covering with collage and decoupage, created with pieces of printed metallic ribbon. 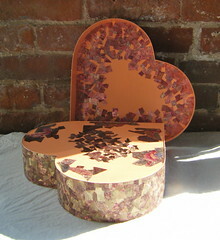 I concentrated on the bottom of the box, shown in the picture: brown center with decoupage floral arrangements around the edge. I worked on the floral border today, combining pieces of flowers and leaves. I decided it was time to do this to determine what the border will look and also to make sure I will have enough floral pieces to make the design work. So now, even though it is not yet complete, the basic layout of the floral border is in place. I also worked a little bit on the pink interior of the box top, also shown in the photo. That was all I had time to do today, but I was satisfied, because getting the floral border blocked in will help me move faster with the rest of the project. 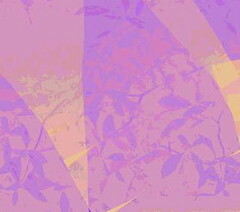 This is one more of the digital images I have been making with Painter's pattern pen. (I call them digital prints.) I used the same pattern I have been working with, created from a photograph of yellow leaves that I took recently. I am using digital pastel with the pattern pen, so I get the shapes of the leaves, but not the original colors of the photo. After I made a few strokes with the pattern pen, I posterized the result, experimenting with the level until I got the effect I wanted. Then I cropped several times, closer and closer, until I got this composition. This image began with a quick photo that I took last month outside a grocery store. 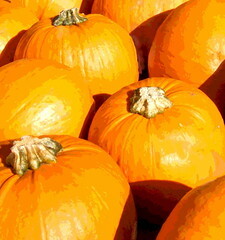 Yesterday I used Painter's digital pastel to remove some supermarket labels from the pumpkins and cleaned them up just bit. Then I posterized the image. I cropped the original photo several times before I settled on this composition. 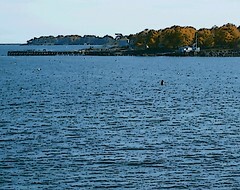 This is a photograph that I took back on November 16 during a walk at Lynch Park, here in Beverly, Massachusetts. This is a view from the park, looking back towards the town. I liked the shapes made by rocks, shoreline and beach. You can see Beverly's Dane Street Beach and Independence Park in the distance. Today I made this image, another "digital print". To me, it has the look of a print, but I made it on the computer. I have been experimenting with this process, trying to figure out what works and what doesn't. I am using Painter's pattern pen, loaded with a pattern I created recently from one of my recent photos of autumn leaves. In this case, I used a red background, and the medium for the pattern pen was digital pastel, in yellow. Then I posterized the image, trying different levels until I had the effect I wanted. Then I cropped it just a little bit to get this composition. This is an image that I made today. I call it a digital "print" because it looks like a print, but I made it on the computer. I used Painter's pattern pen, loaded with a pattern that I created from a recent photo of yellow leaves. I used digital pastel in yellow over a purple background. Then I posterized the image, experimenting with the amount of posterizing until I got the result I wanted. Then I cropped the image (a couple of times) until I had this composition. I stumbled into this little process on my own, and am still experimenting with it, sorting out the best way to use it. This image started with a photograph that I took back in late October at Long Hill Gardens. 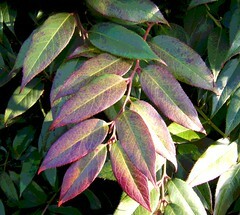 I liked the colors and shapes of these leaves, so I took a picture. 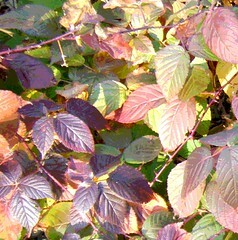 (I am not sure what kind of leaves they are, but it looks like raspberry to me. Anyway, this is some kind of bramble.) Tonight I posterized the original photo in Painter, then cropped to get this composition. 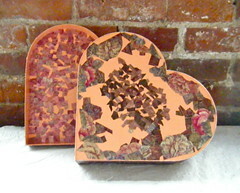 This morning, I finally had a chance to get up to the studio and work on this project, the heart-shaped box that I am covering with decoupage and collage. I am cutting up metallic ribbons in printed with various patterns (crewel, paisley, floral) and putting the pieces together to make my own designs. This photo shows the bottom of the box, which will be brown with a floral border, and the inside of the box top, which is going to be predominantly pink. I worked on both those areas today, as well as the red surface inside the box (not pictured here). As I work, I leave gaps because I am creating these designs as I go, and I am never sure if I will run out of ribbon in a particular print. But if I leave gaps, I can go back and integrate pieces of another color or print. This is a photograph that I took here in Beverly, MA, at Long Hill Gardens. This was taken a few weeks ago (October 25th, to be exact). I liked the sunlight coming through the bright leaves, so I took this picture. The bright light in the upper left corner might be considered a technical problem (and it is), but I think it works in this image. This is pretty much the way the photo looked straight out of the camera. I adjusted the exposure just a tiny bit, and then cropped the edges just a little to improve the composition. I have been extremely short on time, but I stole a few minutes today to create this image. I used Painter's pattern pen, loaded with the leaf pattern that I created recently from one of my photos. I made some broad strokes with the pattern pen. Then I posterized the result, and did some cropping to get this composition. It looks something like a print, but it is really digital art. This is a photograph from a walk at Long Hill Gardens, not so long ago. Tonight I cropped this image out of the original photo. 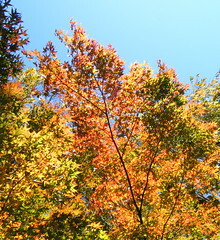 I like the colors of the leaves against the blue sky, and the natural composition of the branches. Well, the leaves are falling fast, and the branches will soon be bare, so here's one more look at the beautiful colors of fall. 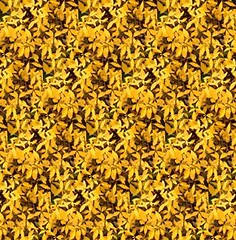 Yesterday I created a pattern from my photograph of yellow autumn leaves. Today I used that pattern to create this image. It isn't really a print, but it looks like one. I used Painter's pattern pen, loaded with my new leaf pattern, to get the basic imagery. Then I posterized it for more color contrast. 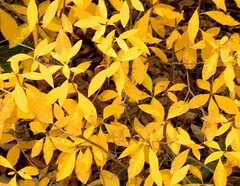 I have been working with a photograph that I took right in my backyard of some beautiful yellow leaves. I posterized the original photo, and yesterday I cropped it to get a closer view for my pattern. 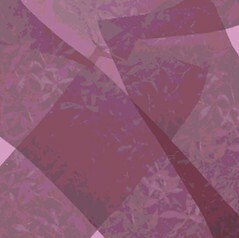 Then I used Painter to "capture" the pattern. To make this image, I adjusted the size and direction of the pattern, and then used it to fill this image. But once you have created a pattern, there is a lot more that can be done with it. To be continued. . . . 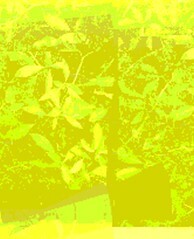 Yesterday I used Painter to posterized my photo of a shrub with yellow leaves that is in my backyard. 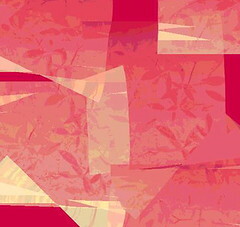 I decided to try to use it for a pattern in Painter, but decided to crop it first. This is how the image looks cropped. Tomorrow I plan to post the pattern I made from this version of the image. 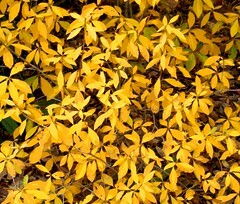 For several weeks now, on my way in and out of the house, I have been noticing a shrub in my yard that has bright yellow leaves. I like the pattern and the color. Yesterday as I was on my way out to run an errand, I finally decided that I had better take pictures of that shrub, because a Nor'easter was on the way, and who knew if there would be any leaves left on anything after that. So I stopped to take some quick photos. Tonight I transferred them into my computer. I used iPhoto to crop this image out of one of the photos, and then used Painter to posterize it. Yesterday I posted a image that is a posterized photograph of this scene, a view of the ocean from Independence Park, in Beverly, MA. I took the original photograph back on October 26. I liked the bright blue water and the fall foliage in the distance (in Salem Willows and Marblehead). Today I opened the original photograph in Painter, but this time I turned the photo into this digital woodcut. This image began with a photograph that I took in late October (the 26th to be exact) during an afternoon walk at Independence Park, here in Beverly, MA. I loved the combination of fall colors and bright blue ocean, so I took some pictures. 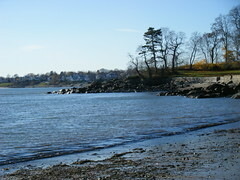 This is the view from the park when you look toward Salem (Salem Willows, and in the distance, Marblehead, I believe.) Tonight I used iPhoto to crop this image out of the original photo. Then I opened the image in Painter and used some selection tools to apply the posterizing effect to everything but the sky. I think this might also make a nice digital woodcut. . . . This image began with a photograph that I took last weekend at Long Hill Gardens (here in Beverly, MA). There are lots of different kinds of trees to see there, and they all change colors at their own pace. Some trees have already lost their all their leaves, some are changing colors, and some are still green. This shrub is often just part of the background at Long Hill, but this time I noticed it because of the way that it is changing colors. The leaves are changing from green to almost purple, and with sun and shadow playing on the leaves in the late afternoon, this seemed like a natural commentary on the passage of time. Later when I transferred the image into the computer, I noticed that a dried up brown oak leaf was wedged in between some of the leaves. And it was in exactly the wrong place, too. So I opened the image in Painter and used some digital pastel to draw into the photo and cover up the dead leaf. Once I had done that, I could then crop the image to get this composition. Then I posterized it just a little bit. This image began with a photograph that I took last weekend during an afternoon walk at Long Hill Gardens here in Beverly, MA. 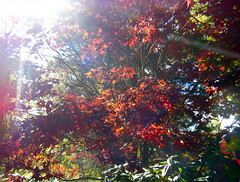 I liked the bright red leaves on this Japanese maple so I took a photograph or two. Tonight I cropped the original photograph, used Painter to posterize it, and then cropped one more time to get this composition. 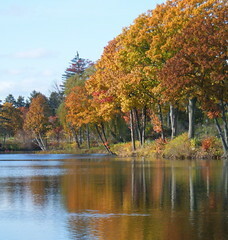 This is a photograph that I took at the Cummings Center Pond here in Beverly MA during an early evening walk. It was around 5:30, but the sun was already setting. I see this pond quite often because for walks, but only occasionally at or after sundown. I liked this little scene, so I took some pictures, and cropped this image out of the best one. (I also corrected the color in iPhoto.) 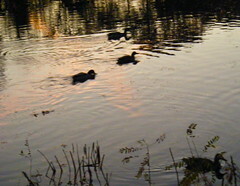 What I was after was the way the colors of the sunset are reflected in the water, the way the lighting emphasized the patterns of the ripples, and the silhouettes of the ducks on the water. 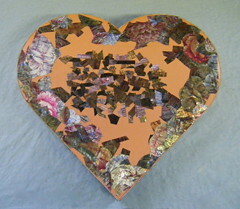 This morning I went to the studio to work on this heart-shaped box which I am covering with printed metallic ribbons, cut up and pieced together to form collage and decoupage designs. Today I started with the bottom of the box, which I am covering with brown ribbon in the center and a floral border around the edges. Most of the work today was finding and cutting pieces of brown ribbon, though I did add a couple of cut out leaves to the floral areas. Then I worked on the inside of the box top, which is leaning against the brick wall in the photo. This area is going more quickly because I am only using one ribbon pattern, and the pieces are larger. And then, although it isn't shown in this photo, I did a little work on the interior of the box, finding tiny bits of bright red ribbon. This is from a photograph that I took today during a walk at Long Hill Gardens, here in Beverly, MA. 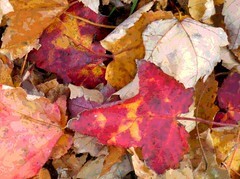 Although there are still leaves on some of the trees, you can see lots of colorful leaves on the ground. These particular leaves were spectacular! The colors looked like pastels. 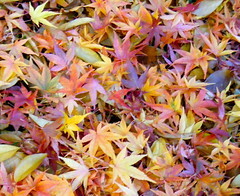 I also liked the patterns and shapes, especially the Japanese maple leaves. Tonight I used iPhoto to correct the color and to crop this image out of the original. This is a photograph that I took last week during a walk at the Cummings Center Pond. I wanted to capture the beautiful colors of the trees, and their reflections in the water. Tonight I cropped the original photo to get this composition, and then used a little iPhoto magic to clean up a few distractions. Cold weather seems to be on the way, so I wonder how long the leaves will last. . . .
A couple of weeks ago (October 22), I posted an image that began with a photograph of fallen leaves. Today I went back to the same batch of photos and saw another one that I liked. 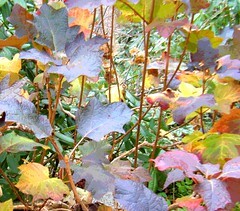 The colors were amazing, although the some of the leaves were broken, torn, and eaten! 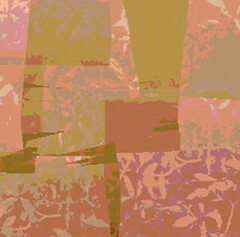 But I opened the image in Painter and used digital pastel to patch the holes, with some color overlay to add variation. Then I posterized the image and cropped it for the composition. Once I had the image uploaded to Flickr, I decided I wanted to crop just a bit more, so I opened the image on line (in Picnic). This is my final cut. This little project took longer than I intended, but I don't mind. The beautiful colors of autumn don't last, so it would be a shame to ignore these beautiful leaves. Here is another view of my collage and decoupage project in progress. 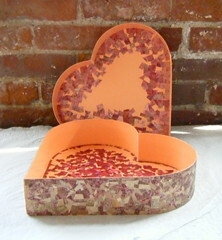 Yesterday I posted a view of the top and bottom of this heart-shaped box as it looked on Sunday. This time I am posting a photo that shows the interior surfaces, which I also worked on this weekend. 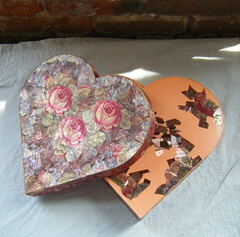 On Sunday I went to the studio to work on this project, a heart-shaped box that I am covering with collage and decoupage. (The box once held a Mother's Day gift from my daughter, and the printed metallic ribbons that I am using were given to me by a friend. ) I only had about an hour to work, so I started with the bottom of the box. This is going to have floral areas around the outer edge, but the center area will be brown. The idea is to have the bottom of the box mirror (but not replicate) the design on the top (also in the photo). I am trying to do the center first, because I don't know if I will have enough brown pieces. Cutting and pasting pieces of brown ribbon might not sound like a compelling way to spend time, but I did enjoy myself. I also did a little work on the inside of the box, so there might be another photograph of this project tomorrow. This image began as a snapshot that I came across in an album today, a picture of my mom in front of our house in Pueblo. 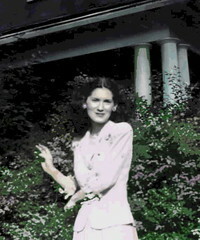 The snapshot was undated, but it looks to be around the mid-1940s, around the time she married my dad. I thought my mom looked great in the original black and white photo, but the snapshot needed to be rescued. There were the usual scratches and marks, but the biggest problem was that the film hadn't been properly advanced, so at the top of the image, there was a line, and above the line, two sets of women's shins (part of the photograph taken immediately before this one)! I thought I could rescue the snapshot, so I decided to try. I scanned the photo into the computer, and then used iPhoto to crop out the extra frame with the extraneous legs, and then cleaned up a few stray marks. (While I was at it, I got rid of my mother's cigarette, something I was never able to do by any other means.) Then I added a little color by using Painter's color overlays and then posterized the image. I liked the composition as it was, but still decided to crop a little closer, and this is the result. Now my mom is the center of attention in this image, and that is what I want for today, because November second was her birthday. I have always found daylight savings time confusing. "What time is it REALLY?" I ask. And all that bother changing the clocks! But I do enjoy the "extra daylight"? ("But how is it extra?" I ask.) Never mind! What I like best about the time change is that suddenly having more or less light available as I go through the routines of the day makes me really look! 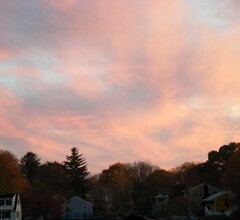 Today's late afternoon walk was in a familiar neighborhood, but the timing was different and so was the sky. The colors were amazing, so I took some pictures. I wanted to capture the autumn leaves against the pastel sky. When I was taking the pictures, I planned to just crop out the houses, but the composition was much better when I didn't crop them out. Instead I opened the photo in Painter, and used a little digital pastel to change a few details. Then I used the "lasso" selection tool so that I could posterize each of the houses, one at a time. This changed the colors and amount of visible detail in the houses, but left the sky and trees just as they were in the original photo. Well, this might sound like too much bother, but I am happy with the result. This daylight was definitely worth saving.